Since arriving in Congress, I have consistently supported efforts to defund and repeal Obamacare. Not only does the law run contrary to our basic American principles of personal freedom and limited government, it is already hurting our economy and will be even more destructive as it is implemented. Although the House has passed numerous pieces of legislation that would repeal or defund the law, the Senate has predictably refused to consider any of that legislation. As a result, Senate Republicans have been denied the opportunity to put the Senate on the record and show whether they support or oppose Obamacare. For the past month I have been urging leadership in the House to give us the opportunity to vote for a continuing resolution that defunds Obamacare. 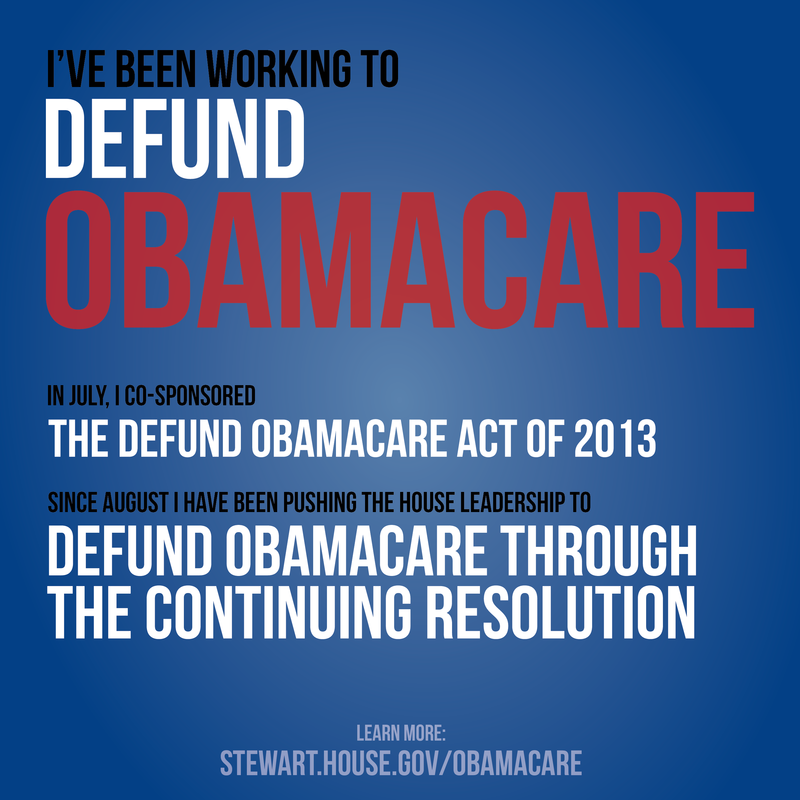 In July, I co-sponsored the Defund Obamacare Act. I also co-sponsored a continuing resolution last week that does just that. A continuing resolution changes the situation. Because a continuing resolution is required to keep the government running beyond September 30th, the Senate will be hard-pressed to ignore it the way they have most of the House’s good legislation. The Senate needs to feel the pressure of the American people to defund Obamacare and work with the House to find conservative alternatives to fix our health care system. I’m confident that we’ll get that chance in the next several weeks. Defunding and repealing Obamacare—again, one of the most destructive laws ever passed—is the first step in fixing our health care system in ways that enhance personal freedom and reduce the role of government. It’s clear that’s what the American people want. The House has voted 40 times to repeal, defund or dismantle the law. I voted for a full repeal of Obamacare on May 16, 2013. In July, I co-sponsored H.R. 2682, Defund Obamacare Act of 2013. On Setpember 13, 2013 I co-sponsored the Stability, Security and Fairness Resolution, which fully de-funds Obamacare, while continuing to fund all other fuctions of the government. On September 20, 2013 I voted for the House Continuting Resolution, which funded the government through the end of the year, while also defunding Obamacare. May 16, 2013 – I voted for H.R. 45, which repealed Obamacare in its entirety as a stand-alone bill. July 17, 2013 – I voted for H.R. 2667, which delayed the implementation of the Obamacare employer mandate for one-year. July 17, 2013 – I voted for H.R.2668, which delayed the implementation of the Obamacare individual mandate for one-year. August 2, 2013 – I voted for H.R.2009, which prevents the IRS from implementing or enforcing any portion of Obamacare. I will continue to do all that I can to seek strategic opportunities to do oversight and defund, delay and repeal this healthcare law. How do we fix our Healthcare System? Fully repeals Obamacare, eliminating billions in taxes and thousands of pages of unworkable regulations and mandates that are driving up health care costs. Spurs competition to lower health care costs by allowing Americans to purchase health insurance across state lines and enabling small businesses to pool together and get the same buying power as large corporations. Reforms medical malpractice laws in a commonsense way that limits trial lawyer fees and non-economic damages while maintaining strong protections for patients. Provides tax reform that allows families and individuals to deduct health care costs, just like companies, leveling the playing field and providing all Americans with a standard deduction for health insurance. Expands access to Health Savings Accounts (HSAs), increasing the amount of pre-tax dollars individuals can deposit into portable savings accounts to be used for health care expenses. Safeguards individuals with pre-existing conditions from being discriminated against purchasing health insurance by bolstering state-based high risk pools and extending HIPAA guaranteed availability protections. Protects the unborn by ensuring no federal funding of abortions.